Note: the run depicted in this writeup was played offline. If you would like to see a separate Livestream recording featuring the Kestrel C, then please follow this link. It was a textbook example of a clean run on Hard difficulty. Enjoy! Here we go again with the last of the Kestrel ship designs. 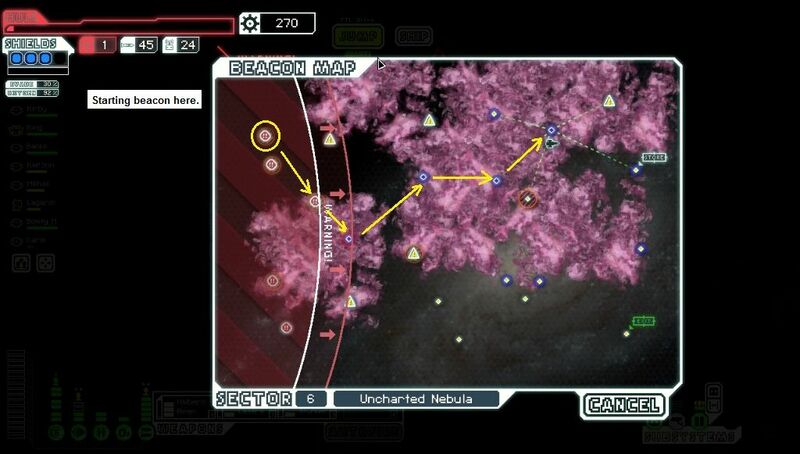 For this voyage on Hard difficulty, I would be trying my hand at the Kestrel's alternate "C" layout. 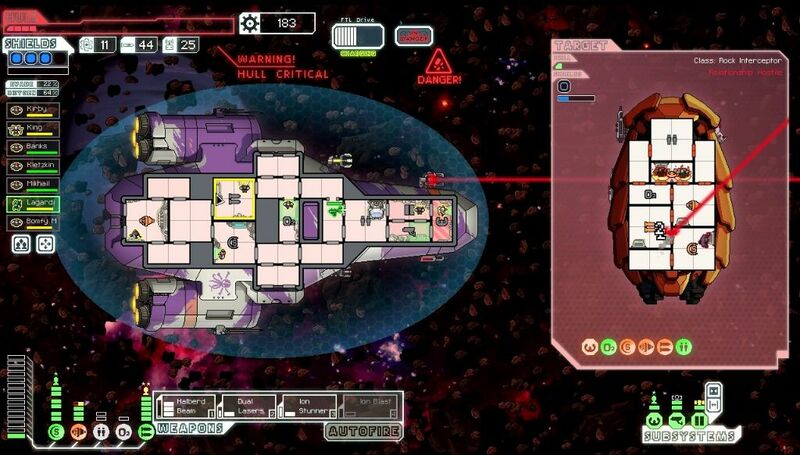 All of the C ships were added in the Advanced Edition of FTL, and most of them make use of the new systems added in the expansion (Hacking, Mind Control, etc.) to one degree or another. The Kestrel C doesn't have anything too crazy, as expected of the default starting ship, but it does swap out the standard Medbay for a Cloning Bay. Ships can only have one or the other in FTL, never both. There are some advantages to the Cloning Bay, such as not caring overmuch if your crewmembers die in a micromanagement error, and allowing you to pick the more dangerous option in a lot of events without fear of losing your shipmates. Giant spiders aren't so bad when the dead guy jumps right back to life again! However, there are some major drawbacks to the cloning facility as well, most notably the fact that you cannot heal your crew at all. There's a passive function from the cloning bay that restores some health with each FTL jump, but otherwise you're stuck with whatever health they have. To get them back to full, you'll have to kill your own crew, and they lose some of their experience when they die. I've found that this makes it noticeably harder to max out skill in piloting and engines (crucial for getting more dodges) compared to the reliable old medbay. Dealing with boarders can be tougher as well, since you can't retreat back to the medbay and fight in there, although of course you can revive anyone who dies in combat. Anyway, this is somewhat of a personal thing, but I do think that the medbay is the stronger option overall. Of course there are more differences to the Kestrel C than just the healing facility. The Kestrel A and Kestrel B are two of the better ship layouts in the game, while the Kestrel C stacks up as only average. Possibly even slightly below average, although there are far worse ship choices. The ship has a Dual Laser (two shots for one power) and an Ion Stunner (one ion shot for one power). These are pretty much the definition of mediocre, with the Ion Stunner able to take out one layer of shields and then the Dual Laser firing in two shots after that. Serviceable, if nothing more. Note that the Kestrel C starts with only level two weapons, compared to the level four weapons on the Kestrel B. Definitely not as good. To compensate, the ship gets... level two Scanners. Well, whoop de doo. Scanners are generally pretty useless for an experienced player in FTL, and there's little need to upgrade them. Having a second level in that system gives a couple of blue event options, and that's about it. As for the crew, the Kestrel C has 2 Humans and 1 Lanius on hand. It's a decent mix and a chance to experiment with the Lanius, the new oxygen-draining race in the expansion content. Considered in total, the Kestrel C is decent in its own right, but far inferior to its other Kestrel cousins. This ship uses the white and purple color scheme of the pirates in FTL, and perhaps it's meant to reflect their dangerous, short lifespans. That certainly reflected my experiences with this ship! 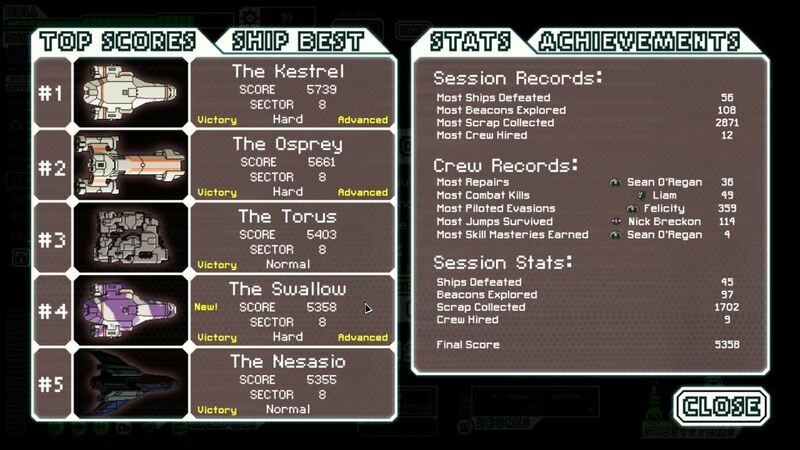 I was able to win with both the Kestrel A and the Kestrel B on my very first attempt at Hard difficulty. A combination of good luck and two strong ship designs saw me through without breaking too much of a sweat. That was not the case with the Kestrel C, for better or for worse. I struggled through a half dozen different attempts without managing to succeed in the Federation's quest. Some of these runs were doomed by my own mistakes, where I would forget to manage one or two small details and see the run fall into a death spiral. Other runs were simply star-crossed and couldn't get off the ground. Sometimes on Hard mode the random number generator (RNG) can be stacked against you, and there's literally nothing that you can do to win. It's part of the fun of FTL. On my best run I managed to reach the rebel flagship in Sector Eight, albeit with probably the weakest setup I've ever had for that battle. Predictably, the rebels shredded my poor guys in the first phase of the battle. Yeah, that was rough. I did feel that I was getting better with time, cutting out more of the mistakes and getting better at knowing exactly how to spend my highly limited scrap. I just needed one good run for everything to click together. That was terrible luck, the absolute worst two possible systems to hit. I had no defenses, I couldn't shoot at their ship, and their ship had a beam droid flying around. Disaster! The one saving grace was that I had fired at their droid controls right before the ion pulse hit. The little one shot laser on that rebel ship was not a danger. The beam droid was the problem, and fortunately I knocked it out temporarily with the Ion Stunner before I could take too much damage. This was still a messy battle, and with the ion pulses playing havoc, I would take 11 damage before it was over. Total reward: 12 scrap. Yeah, can't afford too many more encounters like that one. There was nothing I could have done here, just a bit of bad luck. A free Halberd Beam, just like that! What a huge discovery. All of a sudden, I would be able to slice through enemy ships like a hot knife through butter, and the combination of the Dual Laser and the Ion Stunner actually paired extremely well with the beam. They could knock out the enemy shields and allow me to cut apart the defenseless ship. 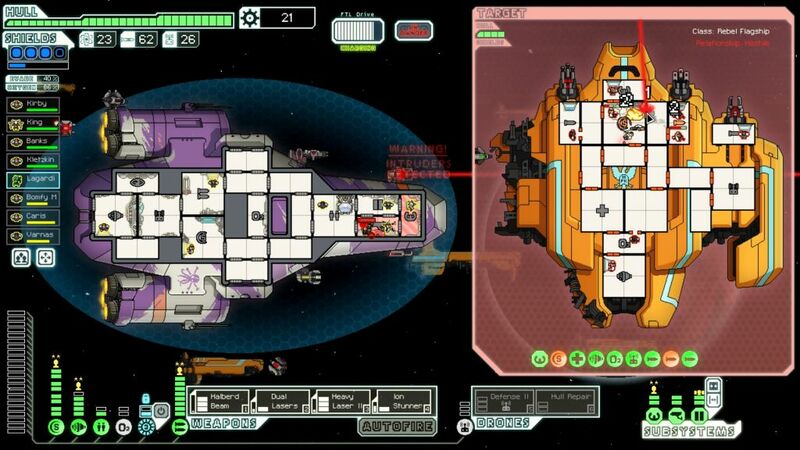 I also managed to get a fourth crewmember in an offer from an enemy ship, adding another Human to go man the shields. Then I was able to purchase Long Range Scanners in a store, still before exiting the first sector! At this point I knew that I had a great start, it was simply a matter of surviving and putting these new tools to use. On the offensive side, the Halberd Beam alone was enough to tear through weak ships with only level 2 shields. Once I upgraded weapons to level 4 and powered up the Dual Laser to pair with the beam weapon, it just got ugly. I had Long Range Scanners so I could see where the fights were located, and the steady infusion of scrap kept me on the comforable side of The Curve. One of the rebel ships was even willing to offer up a Hull Repair Drone to save their miserable lives, which I was happy to accept. Now I just needed to find a Drone Control system to make use of it. Things kept going well throughout Sector Three. I found a sixth crewmember, a Mantis, who was very useful at dealing with enemy boarders. I upgraded engines to level 4 and then shields to level 6, along with weapons to level 5 to make use of all three offensive items on the Kestrel: Halberd Beam, Dual Laser, Ion Stunner. This was a winning combination for the moment, and I had plenty of time to find one more final weapon before the rebel flagship. Damage taken was minimal, only the occasional shot getting through from an enemy Flak or the random missile hits that always take place without cloaking or a defensive drone. I also took the time to upgrade the Cloning Bay to level 2, something that seemed to make a real difference in keeping my crew healthy. The passive healing from the cloning facility is 8 HP per jump at level 1, going up to 16 HP at level 2 and 25 HP at level 3. The base level doesn't seem to be high enough to keep your guys in the green, since it takes six jumps to restore half of your health and a full dozen jumps to get all the way back to full. The second level of the cloning bay doubles the benefit: three FTL jumps to half health, six for the maximum (well 96 HP to be exact). This was plenty to keep everyone safe, and I suffered very few deaths after making this upgrade. Of course it does cost 35 scrap, and you can't afford to be wasting that kind of income unless you're already in a comfortable position as I was here. 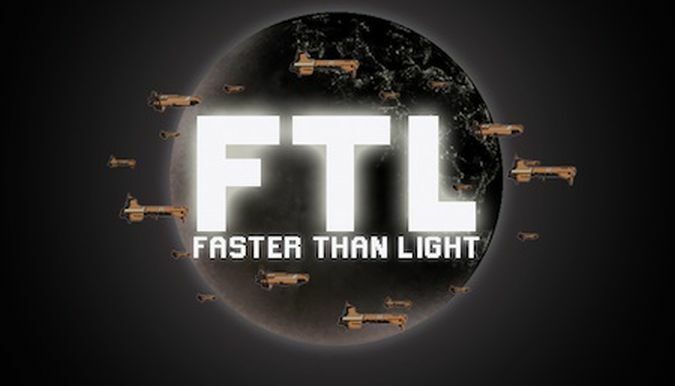 Like so much of FTL, I was able to get stronger because I was already strong to begin with. The snowball rolls down the hill. As awesome as this voyage of the Kestrel C was going, I really was beginning to hurt for lack of stores by the beginning of Sector Four. The wear and tear of constant fights was taking its toll. I had plenty of scrap, enough to purchase all sorts of nice weapons or extra systems. I even had that Hull Repair Drone in storage, unable to use it for lack of a Drone Control. I simply needed to find some way to patch up the increasingly alarming damage that the Kestrel was taking. There were no stores anywhere in Sector Four. Then I was unable to find any stores in Sector Five as well. Even worse, this was the Rock Homeworlds, and the rockmen always love to stuff their ships full of missiles. Sure enough, I took further damage from a slow but steady drip of enemy rockets. I had plenty of evade, but I couldn't dodge them all. Ummm, where are the stores? I last shopped in Sector Two!!! This was about the moment when I realized that the Kestrel C was in very serious danger. 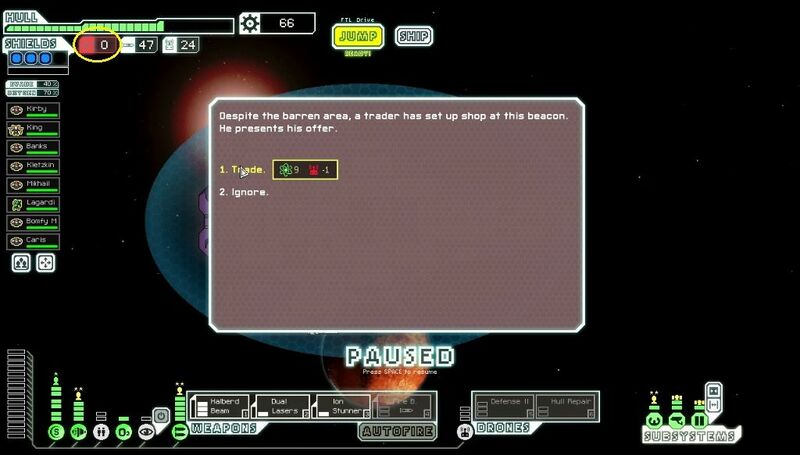 I was stuck midway through Sector Five, still no stores in sight, with all of four bars remaining on the ship's hull. Oh, I was still winning the battles with ease, the current weapon setup dominating the enemy designs. But I couldn't afford to fight anything that was avoidable, since the ship was in such critical condition. I had no choice but to start jumping forward from beacon to beacon, desperately searching for a store, avoiding the battles that Long Range Scanners allowed me to see. 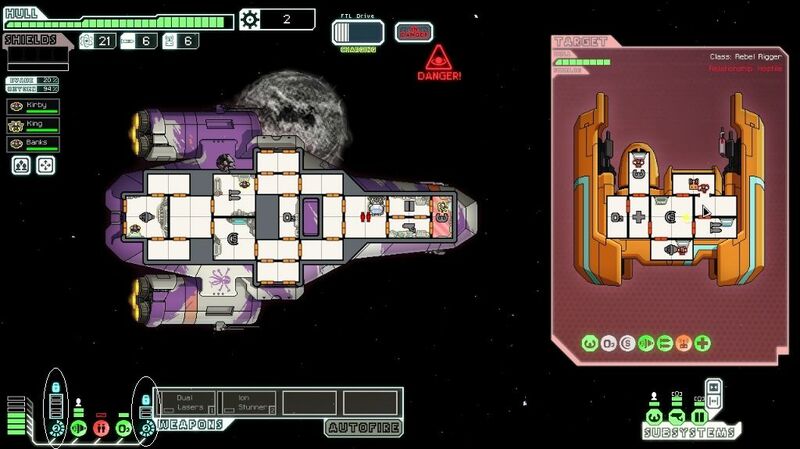 This was literally the exact the wrong strategy for playing FTL - you WANT to fight as much as possible to keep accumulating scrap. As I jumped from beacon to beacon, I wasn't getting any stronger while the enemy ships would only continue to scale up. Yet what could I do? One or two more missiles and this run would be over. Talk about frustrating. By the end of Sector Five, the Kestrel was down to a single point of health. One tick remaining. I had to jump out of the sector with at least five or six potential encounters not fought, hating myself every minute. There was no shop immediately visible in Sector Six either, prompting a mad dash as I leaped around deperately searching for a merchant of some kind. Making matters even worse, I was also about to run out of fuel here. For a run that had started with such promise, it was hard to believe how desperate the straits had become. I had to fight off four boarders in an event, which was more dangerous than it should have been because if they managed to destroy even one system, it would deal a point of damage to the hull and cause the ship to explode. Made it through without any issues, whew. Nervous times here. I continued hopping madly from point to point, holding out hope for a miracle. Check out that crazy path to reach the store. 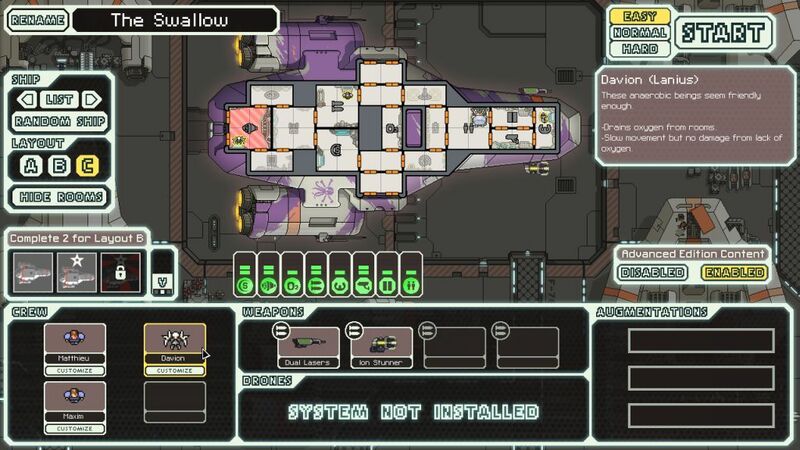 FTL certainly didn't make it easy on me. This was the second turning point of the run, rescuing the Kestrel C from certain death. I'd been saving scrap forever and had a massive 270 to spend. (That's a big number on any difficulty, but especially so on Hard where the rewards are so much lower.) This store turned out to be a vertible gold mine of excellent items for sale. I picked up Cloaking and a Drone Control System, neatly adding the two more important tools for winning the final battle against the rebel flagship. I had purchased a Defensive II drone earlier in an event at a discounted cost, so I was now in excellent shape. Unfortunately in my haste to patch the ship back up, I foolishly paid 60 scrap to heal back 20 health from the store. This was an act of pure stupidity, as I had those hull repair drones on hand and 24 drones in storage. They could have fixed all the damage with ease, I was never going to run out of drones at this point. Call it eagerness or call it panic, some combination of both and acting without thinking. Even worse, I still has zero fuel for the Kestrel C! What a nasty situation. I sold an Ion Blast that had dropped from some earlier battle and used it to purchase the 3 fuel that the store had on hand. That wouldn't last long, but at least it was something. We were back in business now! In the big picture, somehow I managed to go from the beginning of Sector Two to the very end of Sector Six without hitting a single store along the way. That was roughly 40 beacons by my rough count afterwards. If I had found a store in Sector Four or Five, this run would have been a total cakewalk and barely even worth typing up. Instead, I had this epic struggle on my hands, and I was still nowhere near finished yet. I had barely fought in Sector Five, and I hadn't fought a single battle yet in Sector Six. All of my early progress had been dashed, and I was teteering on the edge of falling behind the dreaded Curve. Perhaps I had already dropped too far behind, it was impossible to tell until I got back into battle once more. This was not going to be easy. Folks, you can't make this stuff up. Everyone would accuse me of terrible writing, too much last minute drama. Was this a run of good luck, or a run of bad luck? I didn't even know at this point! Sector Seven was the Slug Home Nebula. I dumped an upgrade into my Oxygen system to avoid the tricks the slugs like to play there, and prepared to fight as many battles as possible. To no surprise, the very first beacon had a slug cruiser that tried to hack my oxygen, and only the upgraded system gave me a blue option that neutralized that threat. Good foresight there. I spotted a store near the beginning of this area, and figured that I had to purchase one more weapon to fit that last slot in preparation for the flagship. I doubted that I would get another chance at a shop, and that hunch turned out to be correct. The only weapon choices on sale were the Stun Bomb (no), the Fire Beam (no), and the Heavy Laser II (hmmm, OK, I guess?) That last one is far from my favorite weapon, requiring three power to fire two shots that deal 2 damage apiece. It's not very efficient in terms of weapons power, even if both shots have the potential to deal four damage when combined. However, it was pretty much this weapon or nothing, so I purchased the Heavy Laser II and began saving scrap to upgrade weapons to the maximum level of 8. At this point, I still needed three more levels in weapons (the three most expensive levels! ), two more levels in shields, another level in engines, plus the extra upgrades in things like doors and piloting and so on that help in the flagship battle. I had whatever remained in Sector Seven and Sector Eight to farm up a whole lot of scrap. Time to fight. It was at this time that I ran into my single hardest ship battle of the run. The fight took place against another slug ship: four shield bubbles, a fast-firing Ion Blast II, a pair of lasers, and a Pike Beam to pour on the damage when shields were down. This enemy craft was extremely hard to hit, and I still didn't quite have full upgrades in weapons yet. I went with the Dual Laser and Heavy Laser pairing to try and knock out enough shields to get damage in with the Halberd Beam. This was a long and extremely tedious process. Meanwhile, the slug ship was ionizing my shields and getting in heavy damage with the lasers. I dodged the worst of it with the cloaking unit, but even that wasn't enough. We dueled over long minutes, and it was only a matter of time until some of my key systems were hit. First shields took damage, then the cloaking unit was knocked out, then piloting went down. I couldn't dodge shots or cloak them, and my shields were ionized. Not good! It was about this time that running away began to look like an appealing option. The Kestrel C was in terrible shape, and it appeared I was about to fall into one of those death spirals as one system after another cascades and falls apart. However, I was very hesitant to skip any battles, since I had so few chances remaining to accumulate scrap before reaching the flagship. I wasn't sure that I could afford to skip this one. I also had more drones than I could possibly use, and the hull repair drones to fix up any damage taken. (I was actually using them DURING the battle to repair hull damage; you can see one at work in that screenshot above.) I might as well stay in the fight unless it was truly critical, the damage could be removed later. And finally, I was simply too stubborn to leave and let the slugs get away. The slugs are my least favorite race in FTL, they aren't very good as crewmembers and their ships always seem to be deadly. I played this one out patiently, fixing the systems as they went down and avoiding any panicked decisions. The crew got shields back online first, then cloaking, then fixed the damage to the oxygen system. The ion damage to the weapons wore off, and I could begin firing back again. Eventually the lasers managed to knock out the shield layers, and the Halberd Beam could go to work. The slugs did try to surrender when their ship dropped into the red zone. I did not accept. Their ruined hull was worth 57 scrap. Three hull repair drones took me back up to full after the finish. What a tough battle. The victory over the slugs gave me enough scrap to upgrade weapons to level 8, and that seemed to put me over a tipping point. Adding the Ion Stunner truly made a huge difference, as it would typically take out a layer of shields on its own, and then the burst of four laser shots could normally eliminate whatever was left. Fire the Halberd Beam and listen for the screams of the enemies. Long Range Scanners allowed me to plot a perfect course through the remainder of Sector Seven, and I wound up fighting nine total battles in the sector. At roughly 50 scrap per battle, that made a massive difference. Sector Eight was more of the same, as I was able to hit an enemy ship or a repair station at every jump, stacking up even more scrap. I took barely any damage, and the minimal amount that I did take was eliminated through the hull repair drones. These repeated victories finally restored me back to the healthy side of the Curve. I was able to get all of the necessary ship upgrades, and even splurge a little bit on stuff like level 2 cloaking (picked up solely to avoid a single missile hit knocking out the system). The only concern was my offense, which remained a little on the slow side. But my defense was excellent, and I could repair mid-battle if things started to go badly. I was confident that this setup could defeat the rebel flagship. In the first phase, the flagship decided to hack my Sensor system. That's the single least dangerous thing that can be hit - thanks, buddy! I used the cloaking unit to dodge the first volley of rockets, no damage taken. My own guns worked perfectly on the first attack, with the Ion Stunner removing one shield bubble, the lasers taking out all remaining shields (and even punching a hole in the hull! 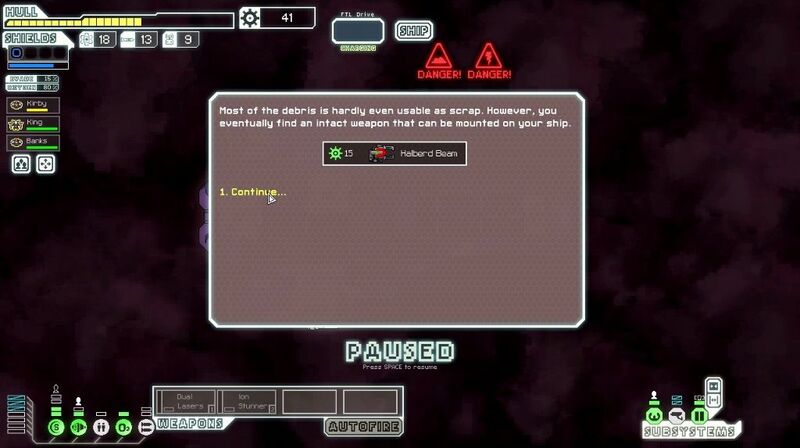 ), then the Halberd Beam getting in max damage with no pesky shields in the way. Just the way it was supposed to work in theory. The second volley finished off the flagship completely. I took two damage in this phase, and that actually came from the laser volley, not the missiles. All of the ion shots had hit earlier. Easy stuff. The second phase was generally more of the same. My defensive drone shot down the first enemy boarding drone, but missed the second one for whatever reason. 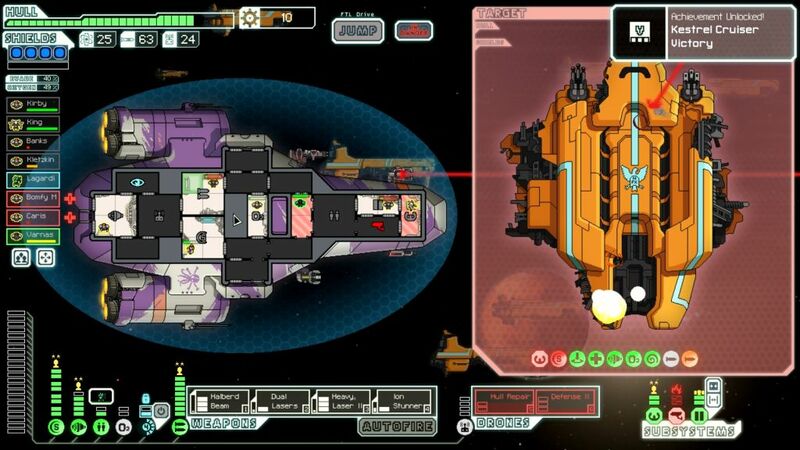 I used the cloaking unit to dodge the first missile trio and drone swarm from the flagship. There really isn't a better system for the final boss, cloaking is worth its weight in gold here. My first volley didn't do quite as much damage to the flagship as the first phase, but three rebels poured into the shield room to try and repair it. The second volley from the Kestrel lit the room on fire and killed two of them, while sending the third fleeing in terror. Take that, rebel scum! Two fewer opponents to fight in the next phase. I took zero damage from this phase and didn't even need to use a hull repair drone afterwards. Everyone was still alive (or in the process of being cloned) when the enemy ship exploded. I discovered that if someone is reviving in the cloning bay, their name will still appear in the ending credits. Interesting, I did not know that. Finally a victory with the Kestrel C after half a dozen attempts, giving me a win with all three of the Kestrel layouts here on Hard difficulty. This was... a weird run. I had so much good fortune in the first sector, picking up the second shield layer immediately and grabbing the Halberd Beam + Long Range Scanners combination. I definitely should not have lost from that point, and it would have been easy sailing from that point under normal circumstances, especially with all of the free crewmembers I kept getting through events. However, the long run through four straight sectors without finding a store nearly killed this voyage. I've had bad luck in that area once or twice before, although I think this was the worst ever for me. It's partly my fault because I tend to choose paths that head through the red sectors (to get more battles), and the red sectors have fewer shops. That said, racing through more than three dozen jumps without finding a single one was pushing the boundaries of probability. I also went back and counted how far I made it on critical damage: I went through eight total beacons with 1 HP remaining on the hull. Eight of them! No one could argue that this was a dull run. On the whole therefore, this was a straightforward run that would have been an extremely easy victory had it not been for that bizarre episode in the middle. I was crushing the game in the early sectors, and by the time of the flagship battle I had accumulated enough scrap from constant fights to be back on the health side of The Curve again. 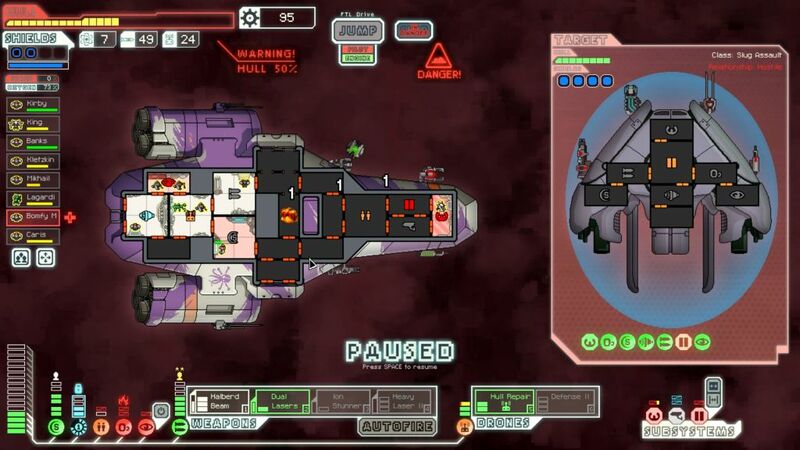 The last boss was about as easy as the flagship gets, and I was never in danger. That mad run with a crippled hull and minimal fuel though... Heh. The stuff of legends. It's a shame that this was being played locally and not on Livestream, I'm sure the viewers would have gotten a kick out of it. Till next time.